recharter is turned in this year. We're using VolunteerSpot to organize our upcoming Recharter turn in. 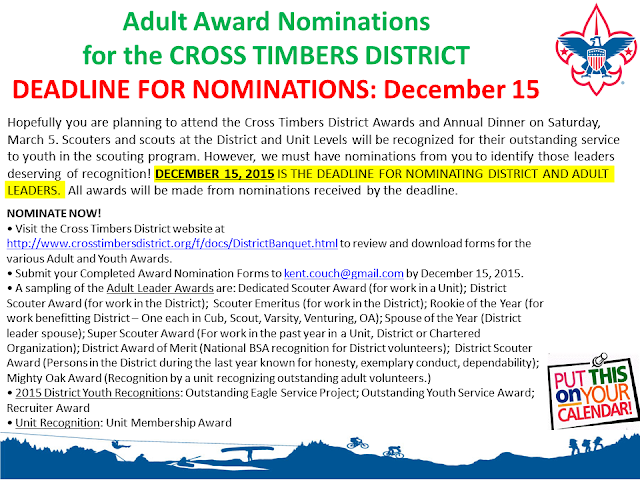 PLEASE NOMINATE YOUR LEADERS TODAY!!!! Special: Venture Crew 1872 will demonstrate how the 4th US Calvary operated 150 years ago. 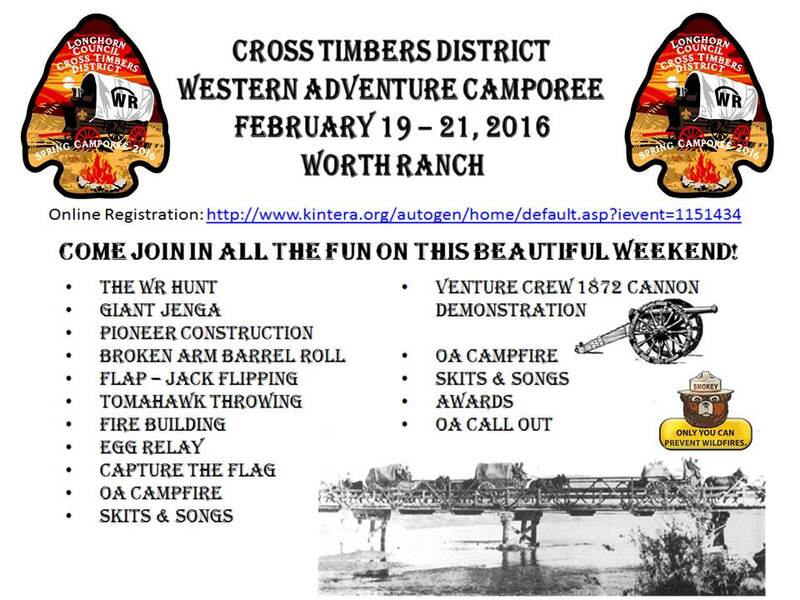 The crew will encourage Scout participation – with their cannon! Turn in your WR Hunt Answers. Do not Go into another unit’s campsite without being invited. Follow the Scout Oath and scout law. 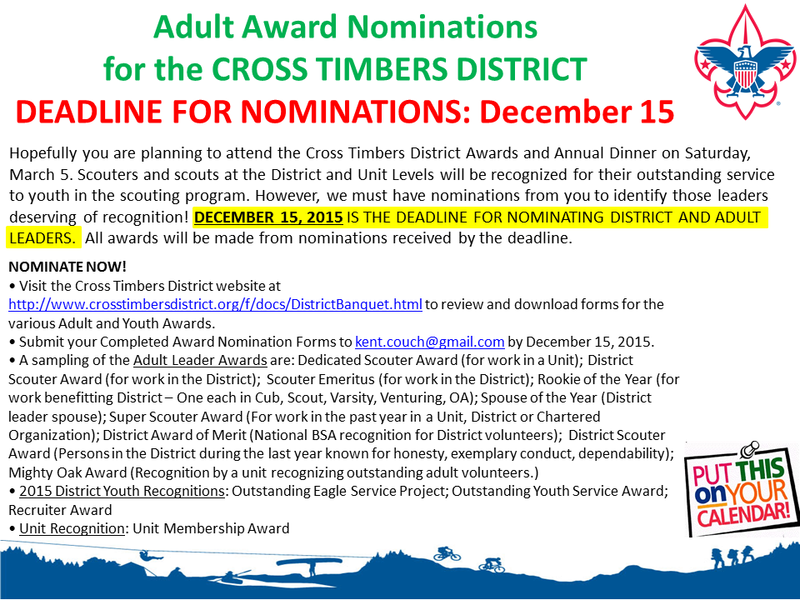 We would like to cordially invite Troop 545 ! Spaghetti will be served with an assortment of sauces, salad, bread, and drink. Assorted desserts can be purchased. Door prizes will be drawn for thru the evening. This exclusive River Legacy Living Science Center ornament is available for a minimum donation of $30. This beautifully crafted ornament pays tribute to the unique award-winning architectural design of the building, representing the grand entrance and one-of-a-kind roof built to look like a bird in flight. Your ornament donation will directly support River Legacy Foundation's mission of education, recreation & preservation. Limited supply available. DONATE NOW online and write ornament donation in the comments section, or give an honorarium gift of $30 or more and your ornament will be sent to your honoree. You can also stop by the Science Center to donate and receive your ornament. Thank you for sustaining the Legacy of Environmental Stewardship with us! 2 pm, November 14, River Legacy Living Science Center. Explore the nature trails surrounding the Science Center on a guided family-friendly Nature Walk. FREE. Space is limited. RSVP to 817.860.6752. 11 am, November 21, River Legacy Living Science Center. Children of all ages are invited to listen to fun, seasonal stories presented by an Arlington Public Librarian. Stay after for related activity. FREE. Space is limited. RSVP to 817.860.6752. 8:30 am, November 21, River Legacy Living Science Center. Look for birds seen in North Texas due to migration patterns during a 1 1/2 to 2-hour birding hike in River Legacy Parks followed by an opportunity to create bird feeders from recycled materials. Led by Maria Panagopoulos of Birds Unlimited. Adult workshop best suited for ages 15 & up. Cost is $5 per person. Please pre-register and pay for program at 817.860.6752, ext. 102 or 104. Living Science Center Closed Thursday, November 26 & Friday, November 27 for the Thanksgiving Holiday. 6 - 10 pm, December 4, River Legacy Living Science Center. Parents get your holiday shopping done or just grab some adult time while your children ages 5 to 12 join in an Awesome Opossum Adventure! Participants will enjoy a pizza party, get to meet our newest Wildlife Ambassador, Luna the opossum, go on a nature walk and create a craft. The evening will end with the movie Over The Hedge (PG). Cost is $25 per child. Register online through November 30 or call 817.860.6752, ext. 102 or 104 to register and pay for the program. 2 pm, December 5, River Legacy Living Science Center. Discover the habits and adaptations of one of our native animals during a live animal observation with a River Legacy Naturalist. FREE. Space is limited. RSVP to 817.860.6752. Living Science Center Closed December 24 -December 25 and January 1 for the holidays. Check out our full calendar of events at www.riverlegacy.org! Sign Up for Our NEW Winter Break Classes at River Legacy! Students in Kindergarten through 6th grades can enjoy a series of nature & science classes during winter break! How many different types of art are there? Discover different types of nature-inspired materials and art projects during this NEW daylong winter class. Students will explore nature through hikes, animal explorations & winter-themed art projects. Sleuth out the clues to uncover the mystery of slime in this NEW daylong winter class. Students will create and play with a variety of mystery substances as they collect evidence to uncover what ingredients created the slime in our "Slime Scene!" What do reptiles & amphibians do in the winter? Explore native and non-native Herps through a winter lens in this NEW daylong winter class. Students will learn about the diversity of reptiles and amphibians across the globe through animal explorations, nature hikes and games. Registration: Register online or call 817.860.6752, ext. 102. Space is limited, so sign up today to give your students a fun learning adventure after the holidays. Naturalists will help Scouts complete some or all of the necessary requirements to achieve the following badges or journeys during River Legacy Scout Badge Day from 10 am to 2 pm, Dec. 12 at River Legacy Living Science Center. Cost is $10 per scout/sibling; parents/chaperones are FREE. Pre-registration is preferred but not required. Register online or in person the day of the event. Scout Badge Day will take place rain or shine, so please dress for the weather. No refunds available once payment is received. 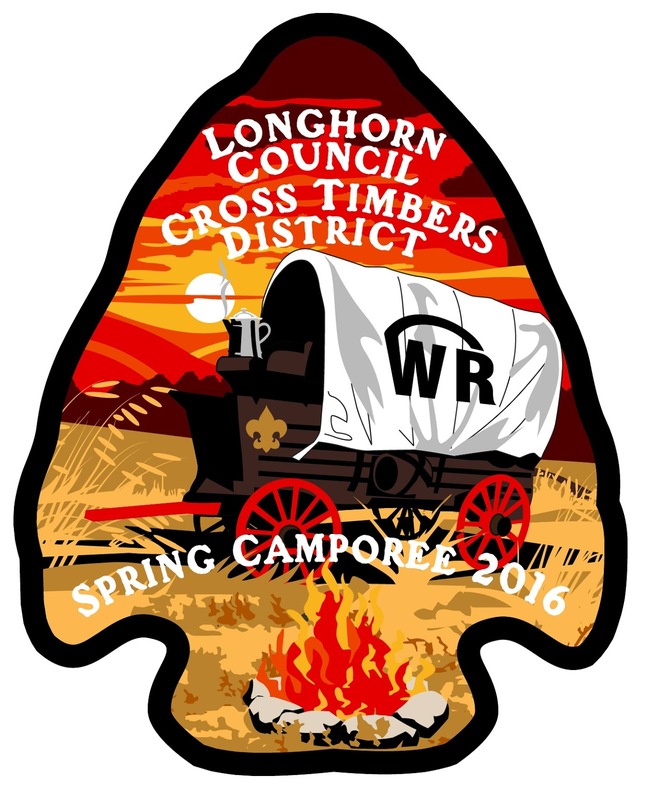 If you are unable to attend Scout Badge Day, contact Shannon Porter at 817.860.6752, ext. 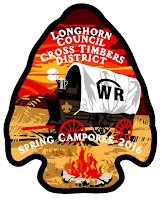 119 to learn more about scheduling a Scout Program at River Legacy Living Science Center. Parents & Preschoolers will discover together just how much fun learning can be at River Legacy Living Science Center! These occasional classes provide a special hands-on learning adventure for children ages 2 years, 6 months to 5 years old with a parent/caregiver. Together they will participate in a hands-on lesson, classroom activities, story and song time, and go on a guided nature walk. Each class meets from 10 am to 11:30 am at River Legacy Living Science Center. Cost is $15 per child/adult pair per class; $5 for 1 additional child (maximum 2 children/adult). Space is limited in each class. Call 817.860.6752, ext. 102 to reserve your spot in a class today. Storybook Studios is donating children's fantasy photoshoot session fees to River Legacy Foundation. Book your photo shoot for $45 per child and Storybook Studios will donate the fees directly to River Legacy Foundation. You will receive a complimentary woodland fantasy photoshoot and one 8 x 10 fantasy portrait (a $250 value with no obligation to purchase anything additional), making wonderful holiday gifts to give or receive! Storybook Studios provides magical woodland portraits for children ages 3 & up (they even do fairy godmothers!). Costumes and props are provided to transform your child into his/her dream fairy or dashing woodland character. After the shoot, your favorite pose is edited with magical effects! To book your fairy photoshoot in support of River Legacy Foundation, schedule your appointment online at www.storybookstudiosdfw.com.